FDA Dangles Golden Ticket To Spur Drugs For Neglected Diseases : Shots - Health News The Food and Drug Administration's approval of a new drug for leishmaniasis came with a voucher that can be redeemed to speed up the approval of a much more lucrative drug in the future. When the Food and Drug Administration gave the OK to a new treatment for a parasitic disease called leishmaniasis in late March, the Canadian company that owns the medicine got something that's quite likely to prove even more valuable than U.S. sales of the drug will ever be. After all, only a handful of Americans get leishmaniasis each year, and that's when they travel overseas. But the approval of the leishmaniasis drug, Impavido, came with a coupon that the company can redeem to have any drug it likes moved toward the front of FDA's line for review. It's only the fourth time that a drugmaker has won one of these vouchers for a priority review, and it could become the first to be auctioned off. The vouchers were created as an incentive to encourage drug companies to work on medicines for neglected diseases, such as leishmaniasis. About 1.3 million people a year become sick with various forms of leishmaniasis, according to the World Health Organization. Between 20,000 and 30,000 die. The parasite that causes the illness is spread by bites from sand flies. The previously available treatments leave a lot to be desired. Knight Therapeutics is looking to sell the voucher to the highest bidder. 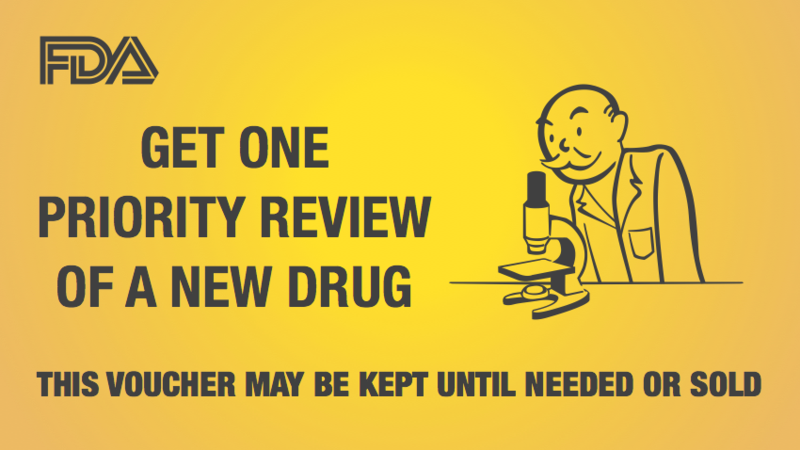 The company that ultimately redeems the voucher with the FDA could shave months from the time it takes for the agency to decide whether a new drug is ready to go to market. An express lane like that could be worth big money to a company in a hurry to start selling a potential blockbuster. How much? Perhaps hundreds of millions of dollars. Richard Evans, a former drug company executive who's now an analyst with Sector & Sovereign Research, figures that a voucher that saves a drugmaker just four months of time waiting in line would easily be worth between $150 million and $300 million for a blockbuster drug. If two companies were vying to be the first to market with big, new drugs to treat the same condition, Evans says, the value of the voucher could skyrocket. Knight Therapeutics, of Montreal, is eager to cash in on the voucher. "We're going to try to sell it for as much as we can," Jeffrey Kadanoff, Knight's chief financial officer, tells Shots. "We'd love to make a big headline." He says Knight hopes "to start a more formal process to sell the voucher in the next month or two." But the company will take its time. "We are in no rush and will wait for the right industry dynamics to maximize its sale value." Knight owes its potential windfall, at least in part, to some academics. Health economist David Ridley, faculty director of the health program at Duke University's Fuqua School of Business, and two colleagues sketched out the voucher idea in the journal Health Affairs back in 2006. A year later, vouchers made it into law, and in 2008 the FDA laid out the rules for companies to follow. Ridley hopes the vouchers become sought-after auction items. The higher the price a voucher fetches, the greater the incentive for companies to develop drugs for neglected diseases, he tells Shots. Some people have criticized vouchers as inefficient. Ridley says a voucher isn't magic, but it could prove to be one tool among many to improve global health. Investors won't criticize a company for developing a drug whose sales might never amount to much, he says, if there's also a lucrative prize that's part of the package.